Description: this Sauropod (large four legged animal with typical long neck) stands in a fairly neutral position except for the tail, which is bent to the left in an almost circular fashion, and the right front leg, which is lifted off the ground and points forward, so the dino strike action can be activated more easily. This attack feature consists of a swinging tail strike (though the figure's package seems to have put it in reverse and mentions 'stomping action', no doubt activated by pushing the tail back and forth), accompanied by a low roaring sound. A second sound can be produced by pushing the white button in the dino damage wound: when pushed, a shrieking roar can be heard, as if the creature is howling in pain. The wound is located on the right flank, and is basically a dark red spot of muscle tissue with small white bones sticking out of it. As usual for Hasbro figures, the wound cannot be covered up, but is constantly exposed. The figure’s long neck is bendable, but only slightly. Green is this Sauropod's colour of choice. Its underside (a very long throat, the belly, and the front half of the lower part of the tail) is painted greenish beige, while the rest of the figure is covered in two different shades of green, the darker one found mostly on the top parts (neck, back, upper part of the tail, upper legs) and the lighter shade between the greenish beige and the darker green, most notably on the head, legs, end of the tail and flanks. The two shades of green gradually dissolve into one another instead of being clearly delineated. The neck, back, front half of the tail and legs sport a number of black stripes, with all of them except those on the neck featuring smaller brown stripes in their centre. The stripes are randomly applied to the creature's body. This Brachiosaurus has small black eyes, white teeth, a pink tongue, a black inside of the mouth, black claws on all toes and a big white JP logo on its right upper leg. The miniature Stegosaurus is basically coloured in four layers. The lowest layer (the belly, throat, most of the lower jaw and underside of the tail) is painted light grey. Above that, the second layer is white, covering the legs, flanks, both sides of the faces and tail. A number of dark grey spots and stripes adorn the white parts of the figure. The top layer is coloured black, covering the creature's back, upper jaw and face, top of the tail, and most notably, the plates and tail spikes. In-between the white and black parts of the Stegosaurus there's the final layer, an orange line on either flank of the figure, running from the base of the neck to the end of the tail, ending just under the last set of plates. The eyes are yellow with black pupils and a black JP III logo can be found on its left back leg. The animal stands in an active posture, with its body bent and its tail dangerously sticking out, like it’s defending itself from an aggressor. Analysis: you can't (and shouldn't) keep a good sculpt down, especially if it's a Sauropod because the various JP toy lines have made far too little use of those awesome beasties. Therefore, JP Dinosaurs 2 sees the return of Hasbro's Brachiosaurus sculpt. It has remained unchanged, so the neat whipping tail action, funky dinosaur sounds and somewhat bendable neck are still present, but unfortunately so are the irritating dino damage wound and awkwardly bent tail. This Brachiosaur's paint job is a lot different that that of its predecessor. It's neither an improvement nor a disappointment, but a nice solid new paint job which fits this figure rather well. The green is dark and smooth enough to not feel ridiculously 'in-your-face' green, but a bit more natural instead. The brown stripes are a nice touch and could also be viewed as old battle scars (in which case; poor creature, to have run into so many conflicts!). Overall, this figure might also make a good Camo-Xtreme Jungle Brachiosaurus (though Brachiosaurs would probably be too big for an actual heavily forested environment in reality). Its Stegosaurus companion is a nice little bonus, but nothing else. Though its paint job is still okay, the fact that it's a reuse instead of a repaint makes it feel like a wasted opportunity. Also, its colouration feels completely inconsistent with its bigger herbivorous counterpart: though it's nowhere stated explicitly that dinosaur paint jobs in two-packs should feel complimentary, these two paint jobs clash a little too much. Overall, aside from the new Brachiosaurus paint job this set offers nothing new, but it's a good chance to expand your line-up of herbivores, since they're grossly outnumbered in the JP toy lines by their meat eating brethren. And of course, any fairly big Sauropod is welcome, considering this is only the second decently sized Brachiosaurus figure in 13 years of JP toys. Repaint: yes. 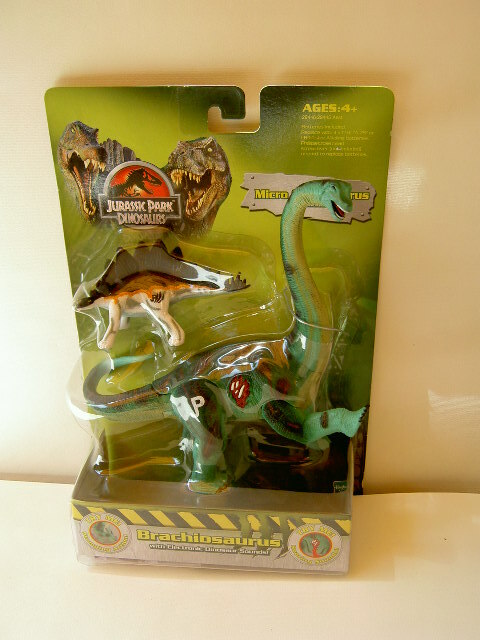 The Brachiosaurus was originally released in the JP III line (Wave 2). It is a first time repaint and, so far, last time repaint too. The Micro Stegosaurus is more or less identical to the figure from the Camo-Xtreme Arctic two-pack, though the paint job might feel a bit harder. This particular sculpt was originally paired with Paul Kirby in Wave 2 of the JP III line, and has since been repainted for Camo-Xtreme, JPD2 and JPD3. Overall rating: 7/10. Not so bad a repaint set. Granted, neither sculpt is new and the Stegosaurus is even a simple reuse, but it still has a solid paint job. The Brachiosaurus is one of Hasbro's better sculpts, and this new paint job fits it fine (though it's not as good as the previous one). Like the other JPD2/3 electronic dinosaur figures, this two-pack was common a few years ago, but has since become much harder to find, in this case even more so than the other JPD2/3 Electronic/Micro sets. If you really want this one, patience is most definitely required, and in this case probably a fair amount of cash as well.